When ACER scientists designed their mesocosm experiments, they had to decide what kind of oil, or oily constituents to use. Was crude oil more appropriate to use to answer their questions, or weathered oil? What about water that came in contact with the oil? What toxins leach into the surrounding water? In this installment of Tool Talk, we examine WAF, or the water accommodated fraction. Oil is broken down or weathered naturally by physical, chemical and biological processes. The more weathered the crude oil becomes, the less toxic it is to plants and animals. We chatted earlier about the type of oil spilled in the Deepwater Horizon oil spill (DWH), sweet Louisiana crude. The type of crude oil determines the appearance, rate and compounds that result from the weathering process. For example, lighter hydrocarbons are typically volatile and evaporate to the atmosphere within a few days. Left behind are heavier molecules; with wave action, these tend to mix with water and make a ‘mousse’, an emulsified oil-water mixture, like milk or pudding. Other, even heavier molecules such as the asphaltenes, which break down much more slowly, tend to coagulate and produce tar balls that typically sink. Thus, as oil weathers, its exact chemical makeup changes. One of the most important tools in a scientist’s tool chest is what we call the manipulative experiment, that is, an experimental design in which one factor is actively changed (manipulated) during the experiments. A comparison of results from the control and from this manipulated ‘treatment’ allows the scientist to attribute any differences observed to the one factor that was changed. Many ACER’s experiments looking at the effects of oil from the Deepwater Horizon event are manipulative experiments conducted in DISL’s mesocosm facility. For these experiments to mimic natural conditions, scientists need to use oil as it would have occurred in the natural environment after the spill, that is in its weathered state. It is important to note that some organisms may not have experienced oil directly, but were in water that contained some of the toxic compounds that leached into the water from the oil. To mimic these conditions, scientists create WAF or water accommodated fraction. And so that results can be compared and repeated across many experiments, scientists studying the DWH have developed a standard process for creating WAF. The comparability of these experiments is important enough that the National Institute for Standards and Technology (NIST), a federal agency in the Department of Commerce, has specific protocols for making WAF. The recipe for WAF involves adding crude oil to water, mixing it really well, and exposing it to light for a period of time. This lets any toxic compounds leach into the water, creating the water accommodated fraction. 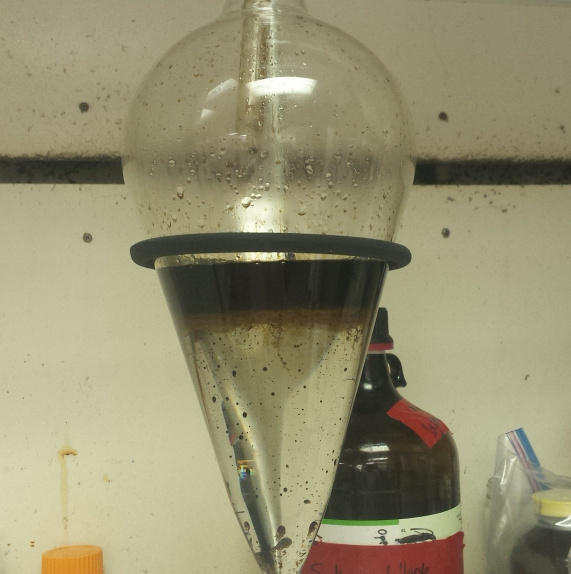 The oil component is then separated from the water & oil component (WAF) using a separatory funnel. As you know from cooking, oil is less dense than water and so rises above the water. A valve on the bottom of the funnel lets the oil & water component drain out, leaving the thick mousse oil at the top. Many of ACER scientists are using WAF in the oil exposure experiments. Dr. Krause’s microplankton group has used WAF to assess oil impacts on plankton community composition and health. Dr. Alison Robertson’s group is using WAF to examine the impact of oil on the structure and function of the benthic microbial community, and Dr. Kelly Dorgan’s Infauna group is investigating how WAF changes the behavior of the animals in the macroinfaunal community. WAF is another important tool for scientists investigating the impacts of the Deepwater Horizon oil spill.